Millan’s success is based upon his personal qualities and the innate communication he has with his dogs. The problem is – his techniques are not transferable to you average suburban dog owner. How many people have you met who can say that they have successfully applied Millan’s training strategy to their dog? I have never met one such person. Interesting post. One with merit as well. 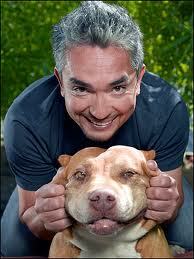 I wonder how much time it takes Cesar to “rehabilitate” the dogs they show on TV. Unless he has a specific “knack” for training those dogs, you’re absolutely correct – no TV show, no book, no DVDs are going to have the same effect for the average dog owner. To be honest, I have tried some of the techniques he has used, and of course, with no success. Even though Cesar has built up a huge empire, more and more people have followed in his footsteps, training dogs well enough to be on TV. Do you think this is all for media, or do you think there is merit in the techniques that are being used on these dogs? The reason Cesar is successful (I don’t doubt his success) is because he ‘exudes’ confidence. Dogs implicitly recognise his as a pack leader. This kind of approach would spell disaster to an average suburban dog owner who simply doesn’t have that kind of personality and experience. Actually it could even be dangerous. It is a great shame that TV’s most recognisable dog personality is preaching methods unsuitable for most dog owners.